Panasonic has long been a consumer industry giant and is now looking at B2B and government business as the future making collegiate sports a big target market. In 2015, NCAA Division I schools generated $9.15 billion in revenue according to USA Today and Department of Education data, yet of the 231 universities, only 77% earned less than $50 million. Because of this large disparity between the top and bottom earning colleges, spending money on technologies in a smart way via a visionary plan is critical for future success. This is why Panasonic USA has emphasized supporting athletic directors with a white paper, roadmap and eBook that helps revenue generation and a return on investment via proprietary technologies and a platform that encourages fan engagement, corporate sponsorships and advertising, in addition to the use of social media and graphics via LED 4K video boards, HD ribbon boards and sounds systems, all integrated with a control room. Panasonic Solutions Group has worked closely with Florida State University and Doak Campbell Stadium, the University of Wyoming War Memorial Stadium and UniWyo Sports Complex, and Colorado State University to enable each to offer an immersive entertainment experience appealing to fans, student-athletes, alumni and corporations alike. The Sports Techie blog continues to do a deep-dive into the Panasonic Company and how it is influencing the United States sports industry with sports tech. Panasonic USA Technology As A College Sports Driver – SportsTechie blog. Because almost half the NCAA Division I schools actually earn under $20 million, it makes financial sense for the administration to consider spending on technology that not only increases the opportunity to attain sponsorship revenues goals but do so with an end-to-end fan engagement platform developed specifically for stadiums and arenas in sport. Panasonic USA found out after doing their due diligence there is a frustration level with using tech to obtain useful fan engagement data, sell digital advertising and engage across social media. This led to the creation of a white paper that helps to understand why and how to implement a venue experience that creates social experiences that are cutting edge, easy to use and ROI driven. Collecting data enables users to mine for demographics and behavioral trends in order to create a new facility experience that is unique, drives revenue and generates live gameday excitement you simply cannot match when sitting at home. RoadMap For Boosting Fan Engagement. Next, college sports programs needed a clear vision and plan to ensure immediate and long-term needs centered on each fan. Panasonic’s College Road Map spells this business journey out. Today, a state-of-the-art video board is a must have as is a rocking audio system and Wi-Fi connectivity. All are paramount to making sure ticket buyers are satisfied with the experiences of a live college sports game and season. A majority of fans want a smart stadium or arena that keeps their mobile devices connected for social communication. The Panasonic RoadMap is designed for effective fan engagement best practices, a measurable ROI and to understand the realities of upgrading. Having advanced stadium and arena technologies also lets potential recruits and existing athletes know a Panasonic-driven athletic program is ready to promote their highlights across social media and on the industry’s best-in-class solutions. 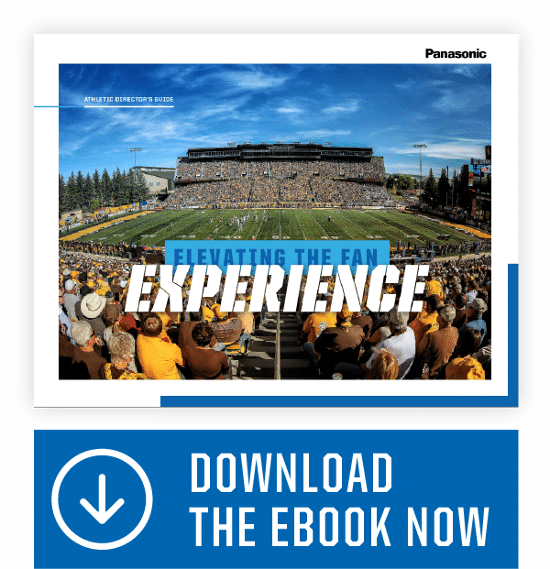 Finally, the Panasonic eBook, the Athletic Director’s Guide to Elevating the Fan Experience talks about where to upgrade, utilizing video boards and using compelling audio systems for digital enhancement to buildings while focusing on social programs designed around connected mobile solutions. 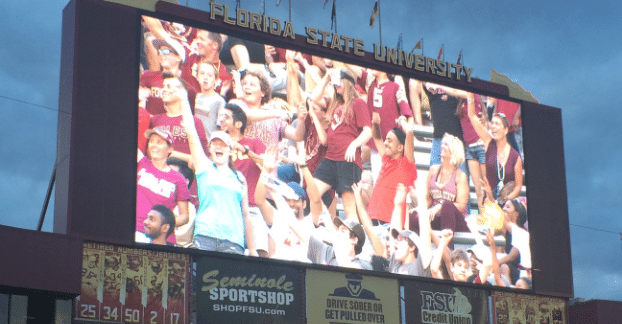 When 84,409 Florida State University Seminole fans start the tomahawk chop, their 7,200 square foot video scoreboard installed in 2016 leads the way in unison with the chant though a 360-degree digital viewing experience. This 57ft by 120ft LED video display’s competitive edge is ranked in the top 10 of largest video boards in D1 college football. The enormous 1080-pixel HD screen syncs with 12 HD video ribbon boards to create a display sensation the university is proud to call a home field advantage. ACC opponents have taken note during gameday of the Panasonic sports tech products as have new advertisers, sponsors and donors. Panasonic USA Solutions Group Video Board at the University of Wyoming. Laramie is located in some of the most beautiful country in the nation and now boasts a Panasonic video board and sound system installed last season at the University of Wyoming’s War Memorial Stadium to generate the kind of excitement bigger budget college sports programs have. Add in a well-placed video board at the UniWyo Sports Complex and the school now can say they are sports technology friendly while providing a fan experience that sets them apart in the Mountain West Conference. The largest score board in the Mountain West Conference has helped the Rams leap to the top of the MW Conference in football much to the delight of fans in the Rocky Mountain state. The video display is nearly the size of a basketball court. Together with the sideline LED ribbon boards and end zone field level LED displays; the install gives the home team a fan experience that meets the demands of their athletic director, coaches, student body, and sponsor partners. 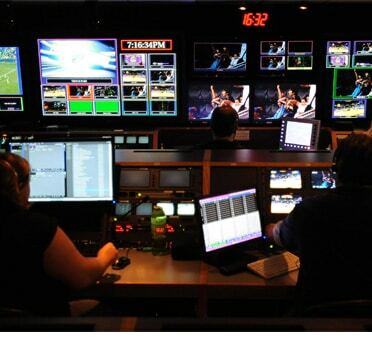 Sports Techie, college sports is an American culture that fans around the world want to be a part of. The fan experiences augmented with technology is fast becoming both the international and domestic standard. No industry is more influenced by this trend than college sports. Panasonic USA caters to the 24 colleges that earn over $100 million down to the majority of D1 colleges that earn far less. The fact is all these college athletic programs need to make sure their technology expenditures enable a quantifiable ROI. The proactive college sports programs that partner with Panasonic will rave about their expertise with planning the audio-visual upgrades, the ease of solution installation and the ongoing staff training that makes this a seamless experience for now and into the future. Panasonic is transforming the college sports fan experience.